Togo (also known as the Togolese Republic) is located in West Africa and is bordered by Ghana to the west, Benin to the east, Burkina Faso to the north, and the Gulf of Guinea to the south. The total area of Togo is 56,785 km2 (21,925 sq mi) and the 2013 estimated population was 7,154,237. Various tribes entered what is now Togo between the 11th and 16th centuries. From the 16th century to the 18th century, the coastal region was a major trading center for Europeans in search of slaves, earning Togo and the surrounding region the name "The Slave Coast." In 1884, Germany declared Togoland a protectorate. After World War I, rule over Togo was transferred to France. Togo gained its independence from France on 27 April 1960. In 1967, Gnassingbé Eyadéma led a successful military coup, after which he became president of Togo until his death in 2005. In Togo, there are about 40 different ethnic groups, the most numerous of which are the Ewe, Kotokoli, Tchamba, Kabyé, and Uaci or Ouatchis. Approximately 51% of the population has indigenous beliefs, 29% is Christian, and 20% Muslim. Mennonite congregations in Togo, the Eglise Mennonite de l'Assemblée des Fidèles du Christ (EMAFC) or Mennonite Church Assembly of the Faithful, are formally related to the Ghana Mennonite Church and began around 1996 growing out of relationships between the Ghanian church's national evangelist and a Pentecostal pastor in Togo. Leopold Sossou Houmey began two congregations near Lome after leaving an independent Pentecostal denomination. Houmey received spiritual support in his church-planting work among the Ewe from Michael Badasu, who at the time was evangelist of the Ghana Mennonite Church. In partnership with the USA's Mennonite Mission Network and Mennonite Church Canada Witness (previously through Mennonite Board of Missions), the Ghana Mennonite Church has provided support for church planting in Togo. Mennonite World Conference. "2003 Africa Mennonite & Brethren in Christ Churches." Web. 2 March 2011. http://www.mwc-cmm.org/Directory/2003africa.html. [Broken Link]. Mennonite World Conference. "Mennonite and Brethren in Christ Churches Worldwide, 2009: Africa." Web. 2 March 2011. http://www.mwc-cmm.org/en15/files/Members%202009/Africa%20Summary.doc. [Broken Link]. Mennonite World Conference. World Directory = Directorio mundial = Répertoire mondial 2012: Mennonite, Brethren in Christ and Related Churches = Iglesias Menonitas, de los Hermanos en Cristo y afines = Églises Mennonites, Frères en Christ et Apparentées. Kitchener, ON: Mennonite World Conference, 2012: 7. Wikipedia. "Togo." 16 May 2014. Web. 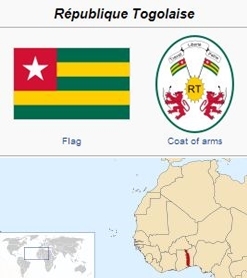 19 May 2014. http://en.wikipedia.org/wiki/Togo. Thiessen, Richard D. "Togo." Global Anabaptist Mennonite Encyclopedia Online. May 2014. Web. 19 Apr 2019. http://gameo.org/index.php?title=Togo&oldid=122210. Thiessen, Richard D. (May 2014). Togo. Global Anabaptist Mennonite Encyclopedia Online. Retrieved 19 April 2019, from http://gameo.org/index.php?title=Togo&oldid=122210. This page was last modified on 19 May 2014, at 19:20.